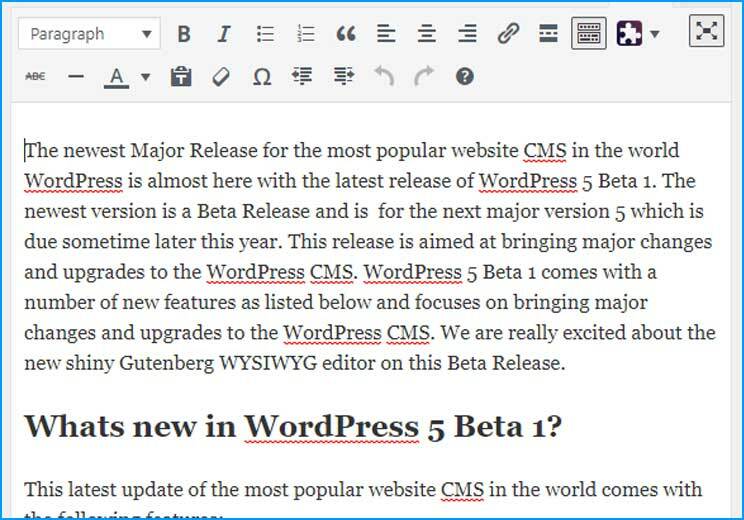 The newest Major Release for the most popular website CMS in the world WordPress is almost here with the latest release of WordPress 5 Beta 1. The newest version is a Beta Release and is for the next major version 5 which is due sometime later this year. This release is aimed at bringing major changes and upgrades to the WordPress CMS. WordPress 5 Beta 1 comes with a number of new features as listed below and focuses on bringing major changes and upgrades to the WordPress CMS. We are really excited about the new shiny Gutenberg WYSIWYG editor on this Beta Release. Whats new in WordPress 5 Beta 1? 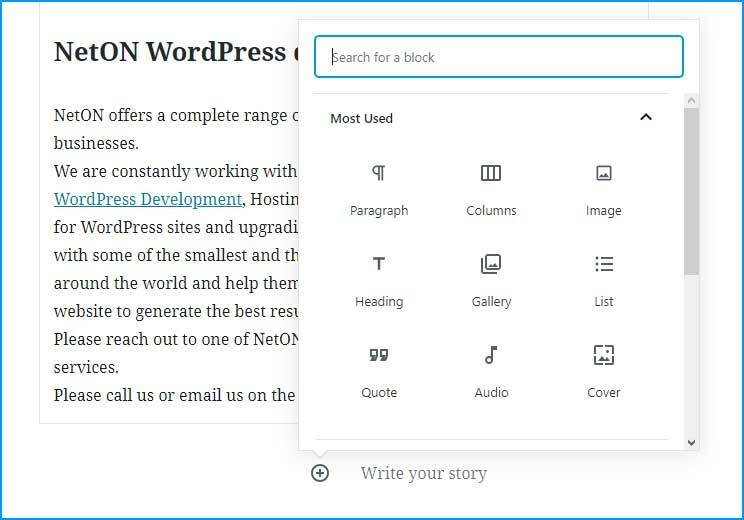 This beta release of WordPress 5 come with the shiny new Gutenberg WYSIWYG editor. This editor will eventually replace the current classic WYSIWYG editor that WordPress currently has. Here is a comparison of the two editors. While Gutenberg editor has had it’s fair share of criticism, we love it here. It’s still a big buggy but its smooth, fast and does the basics. We are using the Gutenberg editor to write this post. Gutenberg has a number of features which make it easier for developers and website owners/marketing users. Utilising Gutenberg means that you are using less plugins. So plugins for tables/ columns and page builders can now be removed completely because Gutenberg editor handles that for you. Gutenberg uses blocks allowing you to modularise your content and use different types of contents in different blocks. The available blocks are listed below. 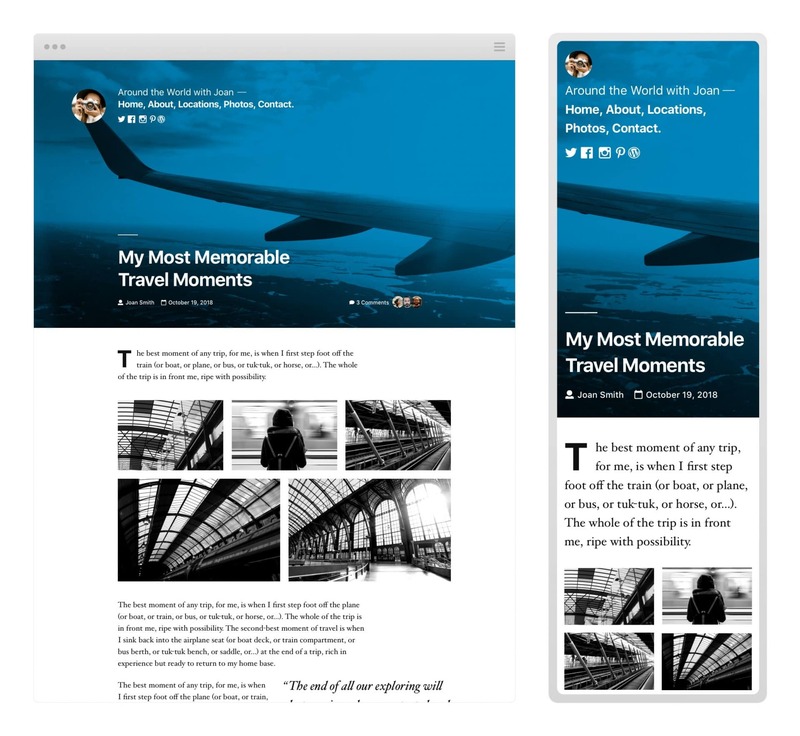 Gutenberg uses layout elements so that putting things side by side is a piece of cake. Also what you see in your screen is most likely how it will display to a user as well. With this new release comes the long awaited new Twenty Nineteen theme. This theme has been built to showcase the Gutenberg editor and we are a bit disappointed that this looks very similar to the previous theme. However we expect this theme to get better as WordPress 5 gets closer to release. Want to try out all the new features :). We keep an upto date demo site with the latest (sometimes even nightly builds) of WordPress that you are welcome to have a look at. We have even installed the new theme so that you can check it out. Click here to view WordPress Demo Site. WordPress is arguably the most powerful blogging and website content management system (or CMS) in existence today. 30% of all new domains run on WordPress. 60% of all CMS run websites run on WordPress. Beta releases of WordPress are good for testing by developers and not intended to be used on live websites. Please read through this post to see what is coming to WordPress, however noting that the final version may be slightly different from the Beta Release. Please note that the NetON team won’t be updating your website with this version because this is not a final version. We will update your installation when the full production version is released. NetON offers a complete range of WordPress Services for Australian businesses. We are constantly working with our clients on WordPress Website Design, WordPress Development, Hosting, WordPress Security, SEO Optimisation for WordPress sites and upgrading Core WordPress and Plugins. We work with some of the smallest and the biggest companies in Australia and around the world and help them build and maintain their WordPress website to generate the best results for them. Please reach out to one of NetON’s Account Managers for more of our services. Please call us or email us on the details on our Contact Us page.